If you're in the mood for a cute game with a lot to offer, then the King Cashalot slot machine from Microgaming Software is a great choice. It is a five-reel, nine-payline machine that's been around for quite some time but still remains incredibly popular. 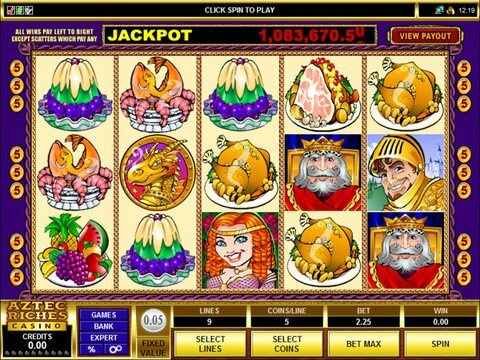 You'll see the King and other royal fare, and you can review it with no download and no registration required with the King Cashalot free play slot demo that is available on this page for computers or mobile devices. You can spend anything from a nickel to $2.25 a spin, so this is a great choice for people on a budget. The in-game jackpot is 150,000 coins, but the progressive prize is where the real money is. Here, the average once-a-year big win is more than half a million dollars, but you have to play for real money to win! The King acts as the wild symbol and he will substitute for regular icons to provide winning combinations with double the value. There's also the Jester that pays any if he appears twice or more anywhere on the screen, whether or not he is on an active payline. Finally, there's a Treasure Bonus that is triggered by two or more Golden Dragon symbols. Here, the goal is to make choices to see what you've won, and you can even risk it for a second choice knowing that you may lose it all. Kings and queens make interesting themes for slots, but if you're in the mood for famous princesses, then Cleopatra is another great choice. With five reels and 20 paylines filled with Egyptian icons, you'll win quite often with help from frequent wilds and 15 free spins during which all of your wins are multiplied. What's more, rather than the Sphinx scatter paying any, it actually multiplies your line bet up to 100x!